PcTutorial.info: Tips for using Windows 8 like Windows 7 with a Startbutton and Startmenu and older Windows operating systems for improve usability and performance! Tips for using Windows 8 like Windows 7 with a Startbutton and Startmenu and older Windows operating systems for improve usability and performance! If you previously used Windows 7, Vista, and XP, as your main operating system, but now use Windows 8 on your new computer, I recommend you use a free program called Classic Shell which brings back the Windows 7 startmenu to Windows 8 after you downloaded, and installed it on your computer. You can even set up the startmenu to look like the Windows 98, and XP startmenu if you never used Windows 7 or Vista before. There are other options to make the Startmenu button look like the classic rectangle start button from Windows 98, and for you to install custom skins/themes for Classic shell to make it unique from other startmenus. 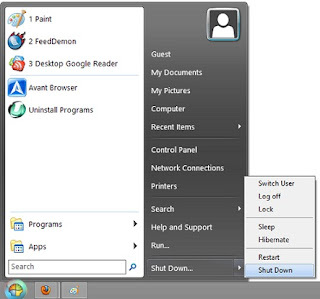 Classic Shell also adds a toolbar to Windows Explorer to make Windows Explorer feel and look like the classic Windows Explorer from Windows XP with the delete, cut, copy, and paste shortcut buttons on Windows Explorer toolbar. After you installed Classic Shell in Windows 8, it will hide the modern touch screen user interface, or you can set it to hide the modern touchscreen user interface, and those live corners in Windows 8, so Windows 5 feel just like Windows 7, XP, or 98 depending on which version of the Windows Startmenu theme you picked in the Classic Shell settings. Using Classic Shell is free compared to hiring someone to install Windows 7 on your new computer, or buying the full cost version of Windows 7 which could be hard to find since some stores may not be selling Windows 7 now, and only have Windows 8 operating systems and computers in stock. Plus, you have all the benefits of Windows 8 like improve security, faster performance, access to the Windows 8 app store, touchscreen support, and other features, but still keep the familiar user interface of Windows 8 when you use Classic Shell for Windows 8. One of the biggest conveniences of Classic shell it is easier to launch programs and apps by pressing the Windows button on the keyboard, and searching for the apps and programs. The built-in search in Classic Shell is also pretty fast. Plus, it is simple to shutdown, hibernate, sleep, restart, and sign-off Windows by clicking the Classic shell startmenu button, and clicking the shutdown button, or the arrow button next to the shut down button to pick sleep, hibernate, and other power options from the right pop-up menu. Another tip, I recommend is right clicking the startmenu's task bar at the bottom of your desktop, and picking properties, and in the taskbar buttons pick "Never Combine", so it shows the labels for opened programs like XP, 98, and other older Windows operating systems instead of the new Icon based taskbar in Windows 7 and 8. If you find the icons in the startmenu are too big, and use too much screen space, I also recommend you check Use Small Taskbar icons to save space on your screen. The notification icons in the system tray can be turned on and off as well by right clicking the system tray, and pick properties where you can turn off the Action Center, keyboard icon, and other icons. If you want to always show icons in the system tray click the customize notification icons, and check the "Always show icons and notifications on Taskbar, and click the OK button at the bottom right. When you are done adjusting your Taskbar's appearance, click the OK, or apply button. Windows 8 comes with a slide show wallpaper, and blue theme, but you can also change the theme of Windows 8 by right clicking the desktop, and picking personalize from the right click menu. In the personalization program, you can change the color of the Windows, wallpaper, notification sounds, and screen savers. If you use the Control Panel Program a lot, in the View by setting on the top right pick either Large or small icon which can make using the Control Panel easier if you are used to the old control panel in Windows 98 to 2000. If you do not like the new Internet Explorer 10 web browser look and feel, Firefox, Google Chrome, Maxthon, Opera, and other web browser should be pretty good as an IE web browser alternative. You can also right click the top of Internet Explorer 10, and click on show tabs on another row to make IE10 look like IE8. You need to open IE from the desktop mode in Windows 8 to launch the desktop version of IE otherwise if you launch it from the touchscreen modern user interface, you'll launch the touch version of IE. However, in the Internet Options for Internet Explorer which you can access by clicking on the gears icon on the top right of IE, and picking Internet Options at the bottom of the menu, and going to the programs tab in internet options, there are options to tell IE to only open websites in the desktop link, and a checkbox to only open the Internet Explorer Tile shortcut in the modern user interface to launch the desktop instead of mobile mode. Check the checkbox, and pick to only open links in desktop mode, and click the OK button at the bottom of Internet options. Now Windows 8, should feel similar to Windows 7 and older versions of Windows after you followed my tips on using classic shell, and making other changes to Windows 8 desktop and taskbar settings. If you want to turn off User Account Controls, you can press the Windows + R key, and type MSconfig, and click on the tools tab. Click on Change UAC Settings to disable, or change the setting to UAC, so they don't pop up as much. While you are in MsConfig, you can click on the Startup tab, and open task manager to disable startup programs with the Task manager. Disabling startup programs can make Windows faster. In Msconfig, you can also disable services in the Services tab, and unchecking services which you may not need like Bluetooth Support Service, and Fax. You can also check the "Hide All Microsoft Services" to make disabling third-party services from Adobe, Mozilla, Malwarebytes, and other third party software easier, but be careful not to disable your computer security, maintenance, and other services for programs you use since it can make your computer less safe. I recommend uninstalling third party startup programs, and services to make Windows have more free space if you rarely use them instead of disabling them in Msconfig. In the Boot tab in Msconfig, you can enable "No GUI boot" which hides the boot animation for some of Windows 8 startup animation to make Windows 8 boot a little bit faster. Windows 8 Readyboost makes Windows faster, so if you have a fast flash drive, or SD card, you can plug it into your computer and use it as a Readyboost drive by clicking on the Readyboost option when a pop-up pops up to ask you what you want to do with the drive. But, I notice sometimes Readyboost interferes with my USB TV tuner making it crash when I am recording TV, so if you plan on recording TV, and using other USB devices, I recommend ejecting/un-mounting your Readyboost storage devices before using USB devices like TV tuners. 2GB or more of RAM should be good enough to run Windows 8 for most general tasks, and multitasking, but 4GB and more RAM would be best for running more intensive Programs like video editors, video convertors, and Photo editors and newer 3D Games. I run Windows 8 on a computer with only 1GB of RAM, and it runs pretty good for web browsing, watching video, listening to music, playing "casual" games from the Windows 8 App Store, office work, and blogging. Tip: Close programs which you are not using, but are still running in the taskbar, system tray, or desktop. If you have programs open in the Windows 8 Modern touch screen user interface, close them by putting your mouse on the top of the screen, and dragging your mouse down wards with the right button being press. You can see what programs are open in the modern desktop by moving your mouse to the top left corner of the desktop, and moving your cursor downwards. Also, close web browser windows, and tabs which you are not using, and uninstall plug-ins and add-ons for your web browsers to free up more CPU and RAM system resources. Upgrading your RAM, video card, and installing Windows 8 to a SSD Hard drive would make Windows 8 faster as well.